Command of Combined Maritime Forces’ (CMF) Combined Task Force (CTF) 151 changed hands last week, with the Republic of Singapore Navy being relieved by a command team from Pakistan. Rear Admiral Giam Hock Koon from the Republic of Singapore Navy (RSN) handed over to Commodore Muhammad Ihsan Qadir of the Pakistan Navy at a formal change of command ceremony in Bahrain. For three months, the Singapore-led CTF-151 team commanded assigned forces to deter and disrupt piracy in the Gulf of Aden. The command team collaborated and coordinated with counter-piracy forces from European Union Naval Forces, NATO, independent deployers from China. India, Japan and Korea as well as regional security authorities. 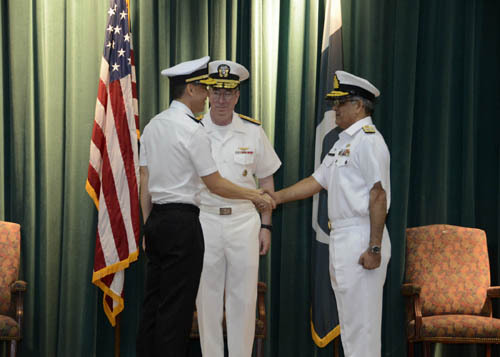 At the ceremony Vice Admiral John W. Miller, CMF’s Commander, commended Singapore for its continued contributions to the multinational counter-piracy efforts in the GoA. 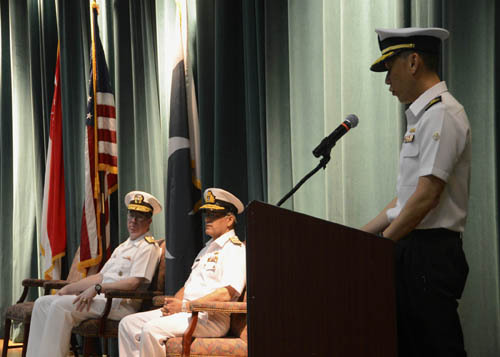 Vice Admiral Miller also welcomed Pakistan back to the leadership of CTF 151, saying: “We are once again privileged and delighted to have Pakistan back in a leadership role in one of our Task Forces. This is the ninth occasion and I am certainly grateful for the commitment of Pakistan to the Combined Maritime Forces. Rear Admiral Giam also highlighted the importance of keeping strategic waterways such as the GoA free for international trade. “The mission of CTF 151 is to disrupt piracy in order to promote security and stability across the Gulf of Aden, Somali Basin, and Arabian Sea,” said Rear Admiral Giam. “It is a crucial task – these 2.5 million square miles of international waters encompass some of the world’s most important shipping lanes and lifelines of the global economy. Rear Admiral Giam’s command team comprised a total of 49 Singaporeans and 12 personnel from the navies of Australia, Brunei, France, Indonesia, Republic of Korea, Saudi Arabia, Thailand, United States, United Arab Emirates, and Vietnam.